It’s almost time for Readercon, my first and favorite con! I’m especially excited because this is my first year on programming. Readercon is July 12-15 in Quincy, and programming on Thursday night is free. For more info, visit their website, Twitter, and Facebook, and if you want to join me… here’s my little schedule! In between I will be wandering, socializing, and trying not to buy All The Books. The notion of the other planets in the solar system being habitable by humans and/or inhabited by aliens held appeal long after it was known that this wasn’t the case. How do we tell these stories and why? Is reimagining the physics and reality of our own solar system easier than FTL? Or is there a romance about it that is lost in the reality of our universe? 8:00 PM – Come find me at the Speculative Boston party! There will be snacks. I got to sign something I wrote. I knew I should have been practicing my signature all these years. The first signature of at least a few, I hope. So that was a delightful moment, and for that I thank Bart Leib, one of the publishers at Crossed Genres, who published my story back in January. 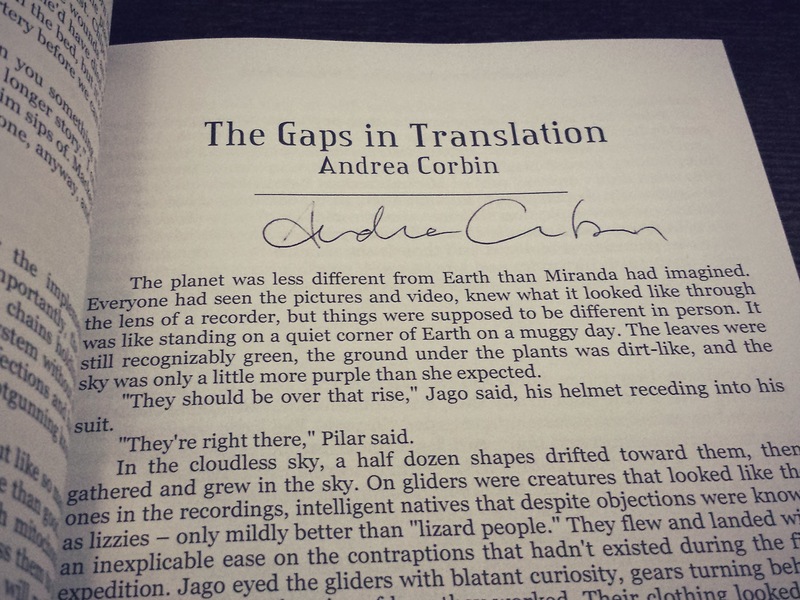 You can read “The Gaps in Translation” here. Coffee in the con suite. Bless the con suite. 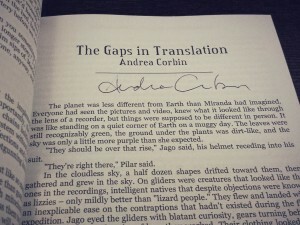 Admiring the poise and style of Sofia Samatar, and getting A Stranger in Olondria signed. All the readings I got to go to! Sofia Samatar, Daniel Jose Older, Max Gladstone, seven contributors to Long Hidden… such riches. I’m spoiled. Kaffeeklatsch! It’s an absolute must. I missed out on Max Gladstone and Lev Grossman (as I expected to happen) but got my name down for Daniel Handler (with Kit Reed and Kate Maruyama)! Daniel Handler said many great things, but one in particular that’s going to stick with me: Writing is like going to work. I mean, I’ve been doing this drive for fifteen years. Shouldn’t the commute be shorter by now? But no, writing doesn’t necessarily get faster over time. I was absolutely thrilled with the amount of discussion of diversity throughout the weekend. Also thrilling: The number of panels that had a “token” man, or no men at all. It can happen! In conclusion, I’m still tired. And have so many books to read!